As expected July in Texas has been Hot, Hot, Hot! No big surprise here. So I'm taking a moment to turn my mind to something that evokes thoughts of cool. I'm hoping that mind over matter is more effective then my ancient air conditioner. With the text block already prepared, it was now time to put on the cover. 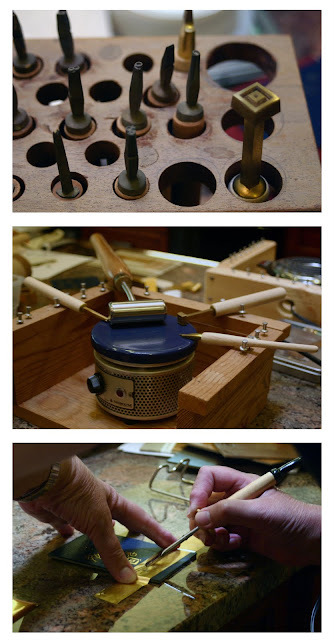 Measurements were carefully taken and museum boards cut and clearly labeled for each step of the process. 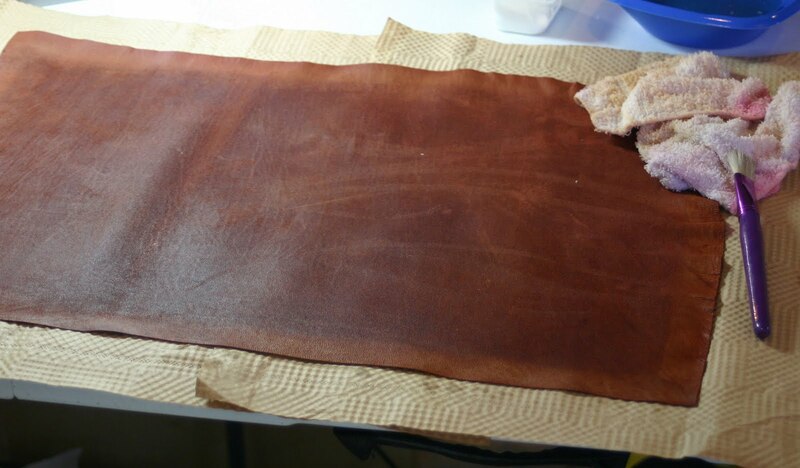 Leather, in this case a naturally tanned terracotta goat skin, was selected and cut for the cover. The leather would take some preparation before it would be ready for the cover. First it must be skived and pared. This is not an area where I have any expertise. Lucky for me I had the support of those fabulous Book Art Babes. Now I know just enough to understand what I must still learn. The Scharf-Fix was used for skiving the boarder of the skin so it would more easily bend around the covers's boards. 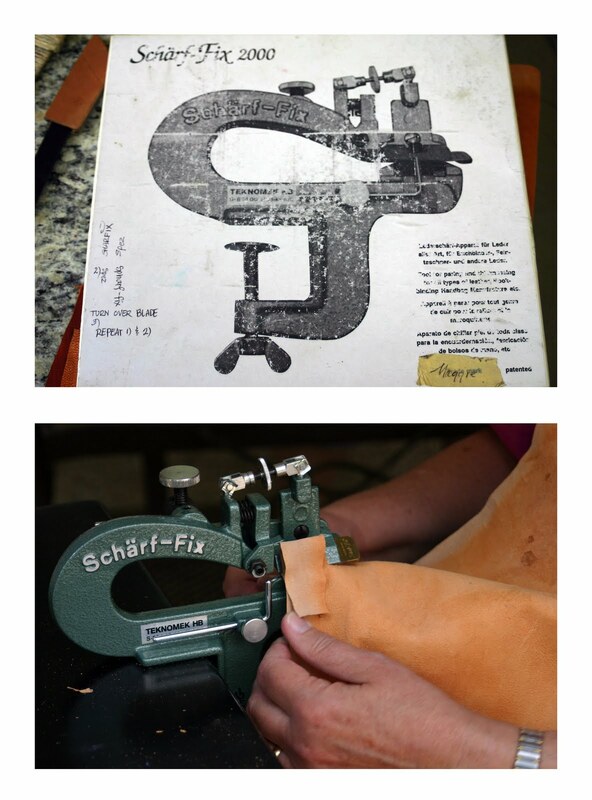 Once skived on the Scharf-Fix a paring knife was used to create a smooth transition to the edges of the skin. 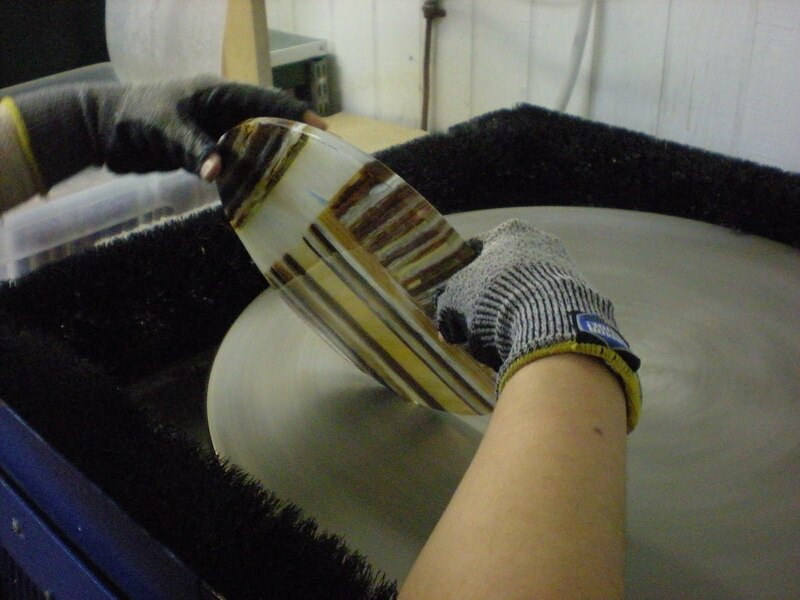 This felt a lot to me like coldworking glass. Using one's finger to feel for a smooth transition while carefully removing material. The material and tools were unfamiliar but the goal was not. 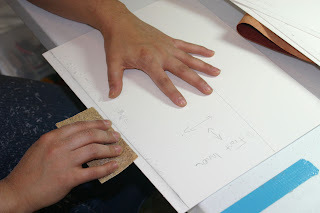 The edges of the boards were sanded down at an angle to allow the cover to easily open and close. 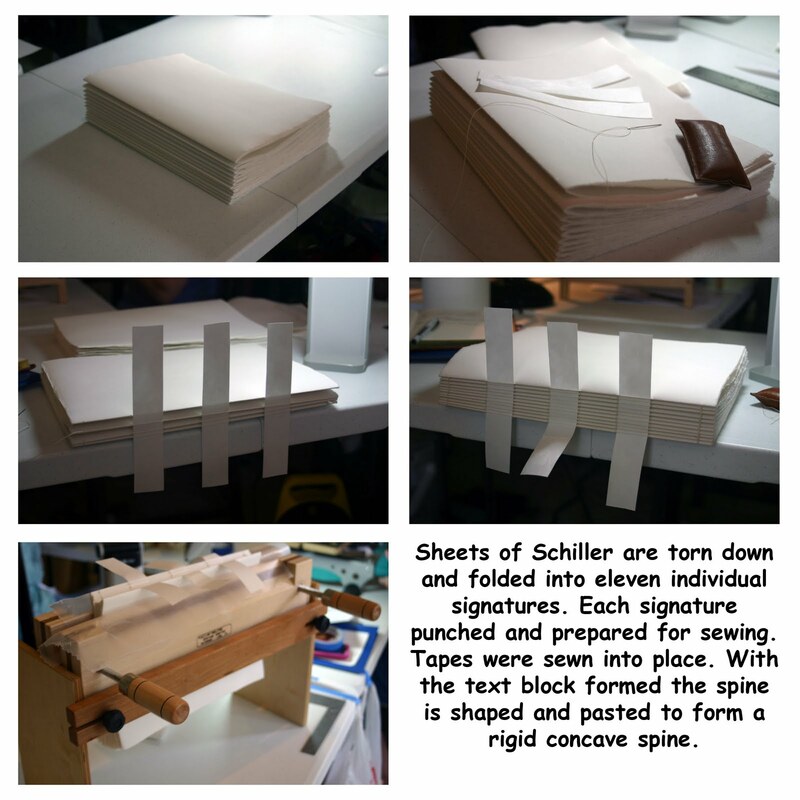 Once completed the boards were attached to the text block tapes to form the skeleton of the books cover. 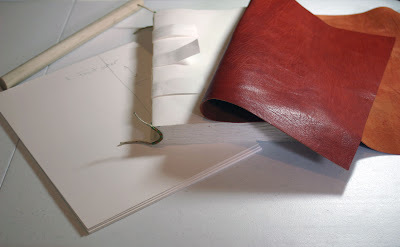 The leather was prepared and the book covered. This was not without it's challenges. Although I have applied leather to a book's cover on a couple previous occasions (e.g. book with cords one and two), the variation of this concave spine provided me a learning opportunity I am not likely to forget. Molding the leather into instead of over the spine, I "stole" a bit more leather from one side then the other making the remaining job a little dicey. Making mistakes is how you learn. 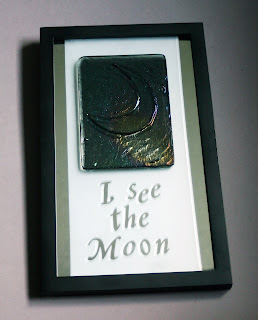 Overcoming them is part and partial for the course in bookbinding, kilnformed glass or any other form of craft. I'm a little wiser for this experience. Once complete the book went under pressure. The next and last day was devoted to finishing touches. End pages were put in. 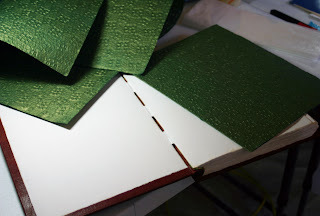 I selected a green embossed paper with a subtle gold sheen that worked with the green in my the headbands I had sewn into the book back on day two. The green provided a lovely contrast to the terracotta leather cover. 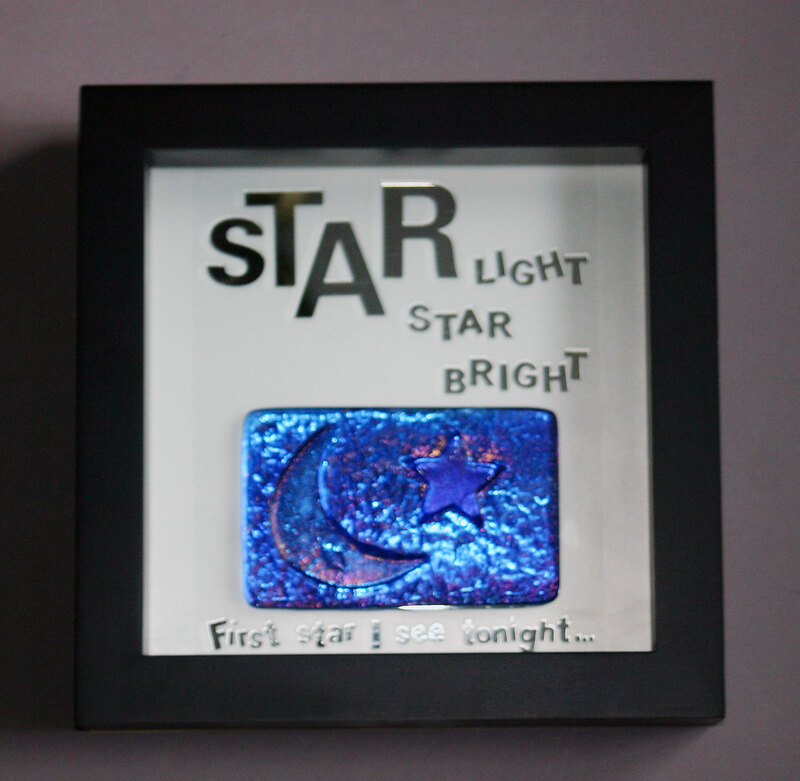 But the finishing touches didn't end inside the book. 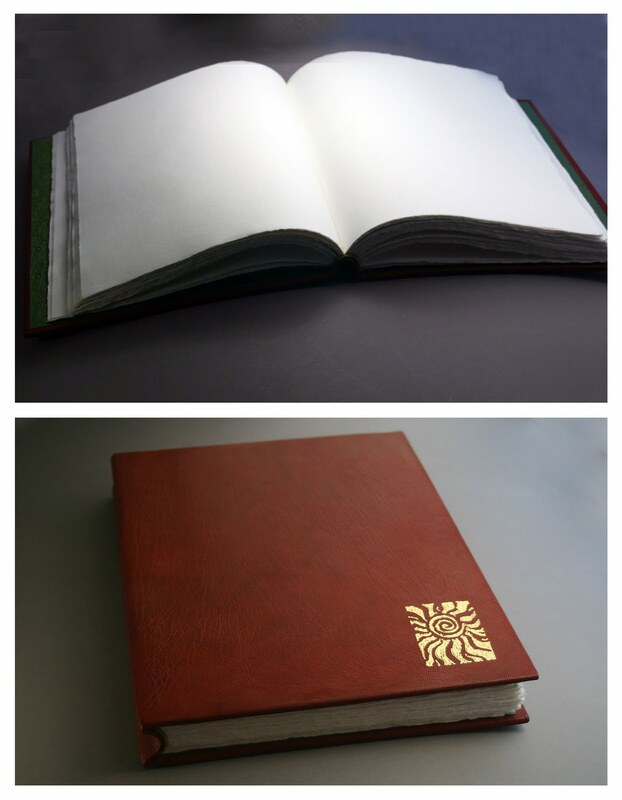 On the outside of the book gold tooling was used to add a design on the front cover. I reached way back to a design I carved on a lino block years ago, shrunk down the image to just the right size and embossed it in 23k gold on the front cover. Simple, elegant, functional... my favorite things. Capturing, developing and planning the execution of an idea are important parts of the creative process. For me, personally developing the place where this takes place makes it all the more special. The books I have made are my own. They become a safe home for my ideas good and bad. After working to build and then fill a book it becomes an old dear friend, my own adult version of the velveteen rabbit. On occasion however, I become afraid to write in a book. This happened to me with the book I made in May of 2010, whose pages are to day still blank. What I have to say doesn't seem to match a book so formal and unnatural to open and write in. 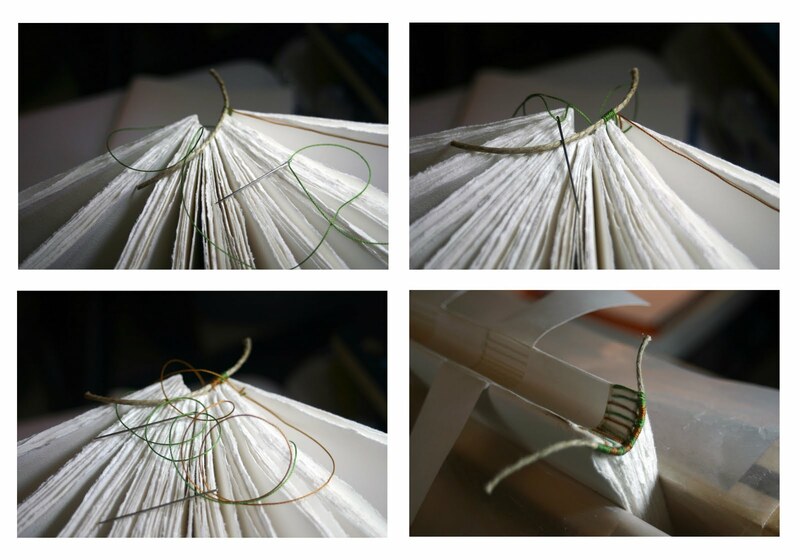 For that reason, I am very excited to be learning a new bookbinding technique under the wonderful and wise guidance of the Book Art Babes. This contemporary binding, the rigid concave spine, was developed by James Brockman. This binding is beautiful in it functionality and thus one I believe I will use comfortably and confidently. ﻿When I start on a particular piece I have a vision of what I want to accomplish. As I work that vision adjusts and becomes real. 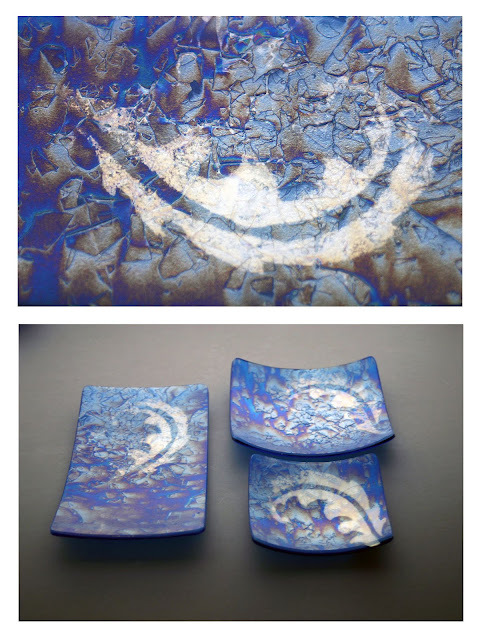 I gain a familiarity with the work; the raw materials, the changes that take place in the kiln, and the changes I effect coldworking. In the end I am intimately acquainted with the piece as it stands alone. 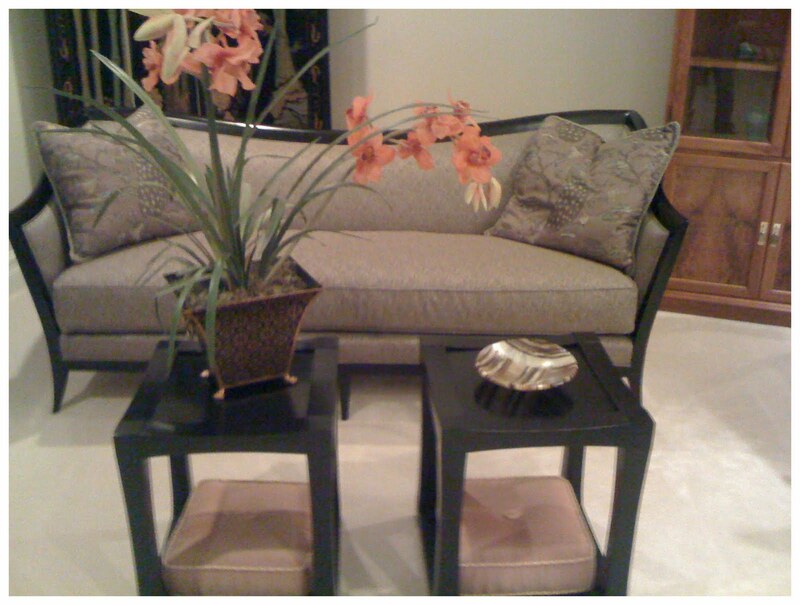 I catalog it, photograph it but rarely see the work in the fuller context of someones home or office. Recently several people sent me pictures of the pieces they purchased on display. It was really wonderful to see how these items fit into their new environment and how they contributed to another's vision/design. Thank you so very much for sharing. It brings me great joy to see these pieces become a part of someone's world. 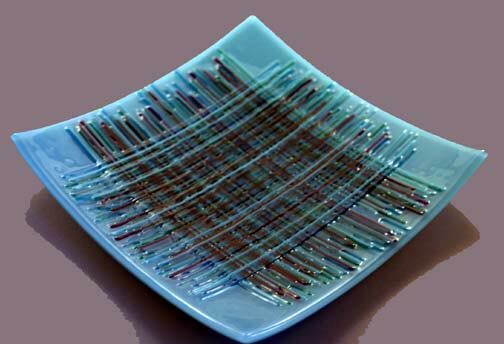 Learn the techniques to turn glass sheets, rods, and stringers into sparkling textural glass fabric forms. The class focuses using glass as threads to make your own faux and true weaved glass fabrics which can be used to create architectural textiles, or components for inclusion in larger projects. Are we what we do or what we believe we are or what others believe us to be? One the first questions we are asked or ask to ascertain information about someone is, "what do you do". By there response we think we obtain some understanding about an individual. But are we really what we do? I have a full time job. I get up each morning, make my way through traffic to work at a computer, attend meetings and conference calls, and hopefully make educated decisions. So does doing this make me less of an artist? This is a question I often battle with in my own head. I sometimes feel as if I am living two different lives, the corporate and the creative one. Yet neither one defines me. They are just things I do. Just because I work for a large company does not make me less of an individual artist. From time to time I need a reminder of this. It was during one of these moments that I stumbled upon Summer Pierre's The Artist in the Office. This was a fun read that helped remind me of some of the basics of living a creative life. It is all a matter of perspective and sometimes we just have to stop and look at things from a different point of view. Now with refreshed perspective I decided I could also use some reminders on how to balance my various roles while doing my best at each. Several years ago I had read Julia Cameron's The Sound of Paper. It had been a beneficial experience, so when I saw The Artist Way At Work I purchased it. Only it sat on my bookshelf unread until June of this year. Running into my own little existential crisis I pulled it off the shelf three weeks ago. The book outlines a 12 week program for anyone looking to tap into the keys of creativity in the workplace and life in general. Only three weeks in, I am still attempting to reestablishing the habits I had put in place in 2008 which I long since let slide. It was while I was having this self dialog about if one can truly be an artist while holding a full time job that I picked up Alaa Al Aswany's Friendly Fire. Standing in the bookstore I read the Preface trying to decide if I wanted to purchase this book. I came to section 2 where the author describes how he came to be a writer while working as a dentist in Cairo. I was instantly sold. Not only could I relate to the struggle but it was so eloquently written I knew I had to read more. Friendly Fire is a series of short stories each full of characters developed so beautifully I felt as if I knew them. Through Aswany's depictions the characters became real and present. I carried this book in my purse reading a short story during a break from work or while waiting for an appointment. I still have a couple more stories to read before I'm finished, yet I am certain I will be looking for Alwany's other works Chicago and The Yacoubian Building the moment I am done. Alaa Al Aswany a brilliant writer and for me an inspiration. So where has all this left me with my question of artist vs employee? I decided it doesn't really matter. I have wasted enough time thinking about it. I am what I am. I do what I do. I'd rather expend my energy doing and I'll leave the labeling to someone else.